"What a morning! We woke up to a call about a large croc hanging out in a small puddle in the middle of neighborhood. 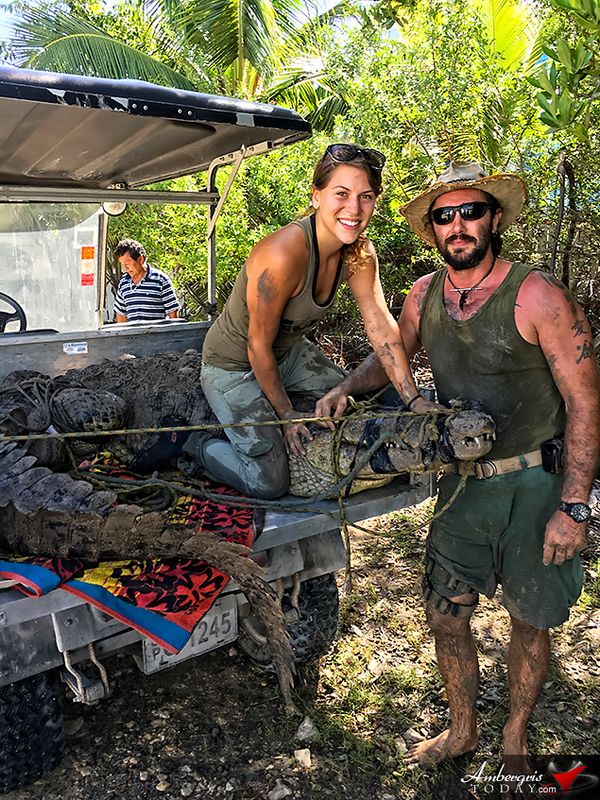 When we showed up on scene, sure enough there was a very large American Crocodile on the side of the road tucked in some trees, smack dab in the middle of San Pablo. This beautiful boy, measuring in at 11.5 feet, was full of energy and strength! He snapped 2 of our ropes before we were able get him controlled and safely secured! 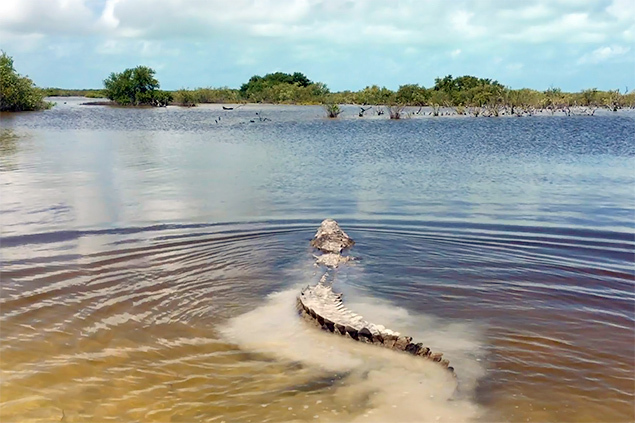 He was relocated by our rickety old golf cart to a location dense with mangrove and loads lagoon channels where he can live freely far from people. We have been asked, why not put him in the zoo? We keep a close watch of the crocs here on San Pedro, monitoring their behavior, and do not see this crocodile as having problematic behavior. Though this croc was found in the middle of a neighborhood, in the eight years ACES has been located on the island, this croc has never been reported to us or showed worrisome behavior. We are hoping that the stress of the capture will reinforce fear of people, deterring him from waltzing into human populated areas again, hopefully encouraging him to stay and live in the area where he was relocated to. Crocodiles are crucial to a healthy environment, keeping a balance of all life in the ecosystem. As a community that relies so greatly on the environment for everyday life, it is our duty to preserve the natural balance as best we can! 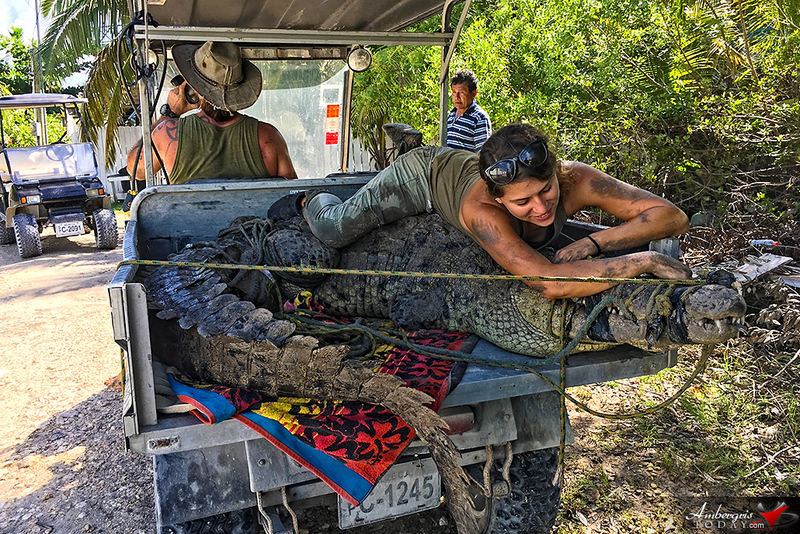 But of course, if you have any questions or concerns about crocodiles or wildlife in your area, please do not hesitate to call ACES or the Belize Forest Department. We are here as a resource for you! Thank you to all the bystanders who bravely lent us a hand in securing and transporting this animal! There is nothing better than having a community come together and assist our efforts to preserve the species!"